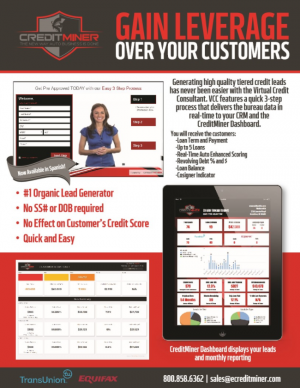 Generating high quality tiered credit leads has never been easier with the use of the “Virtual Credit Consultant”. VCC plugs into any dealers website and features a quick 3-step process. VCC does not require customers to enter their Social Security # or DOB, resulting in max conversion opportunity. Dealers can choose to pre-screen customers in real time resulting in soft pull data being delivered to the CRM of their choice or within the CreditMinerSM dashboard. Very good leads and good quality leads. Pros: Manages this lead source very well. Also makes it faster to do a deal. Thanks for the positive review! Feel free to check out DeskMiner to speed up client interactions in-store. Soft information from the customer, we follow up on the lead. Pros: Customer can fill out their information without revealing their SS # and it is a very non-intimidating way to pre-check their position. Good leads through CRM. We appreciate the 5 stars! Pros: Gives us a basic lead submission. Cons: After they fill it out, we have to call them back and get additional information from them. Sometimes its not complete and it makes it confusing for the customer. Thank you for the comment! Feel free to reach out if you have any issues with form completion and we can work on some solutions. Pros: We get a lot of leads coming in and they are all people that are interested in buying a vehicle. Its right in their face when they visit our website and you can't miss it. Thanks for the positive comment and utilizing our best practices! A little ad space goes a long way for generating leads. Pros: Everything is fine. We get great leads that are complete for the most part and haven't had any problems with them. Thanks much for the positive notes! If you do ever experience any issues, we're just a quick phone call away. Pros: Definitely love having the Virtual Credit Consultant. It is a great conversation starter and we get the basic info so we can move on from there. Pros: We are pleased about everything. Been using them for awhile and there has never been a problem or a hiccup. We're pleased to have you as a client! Thanks much for the kind words. Pros: The customer fills out a quick and easy 3 step process and the lead comes right to us. We then can contact them and start a conversation that way. Pros: Everything is working great. We get great leads from them. Cons: I wish they could add an address. Some leads have the incorrect information as well. Pros: We get great leads from it. Majority of them are filled out completely. Our leads come in through our CRM and are easy to access. This product has not been claimed, so its information can be edited by the DrivingSales community. If you work for CreditMiner, you can claim this vendor or product page.